Cyprus is an island nation located on the Eastern Mediterranean sea. Its statehood has been and still remains slightly messy. It used to be a part of United Kingdom and still very small parts of it (which contain Cypriot exclaves) belong to the UK. The rest is independent and a member of the EU, but Turkey maintains that a part of Cyprus belongs to them – while other countries consider it an illegal occupation. Almost 80% of Cypriot are Greeks by ethnicity and almost 20% are Turkish. Cyprus has a rich history and is a very popular tourist destination, partly because of the very high number of sunlight hours it receives. The downside of that is the chronic water shortage it suffers from. Medications and medical appliances and instruments form important part of the economy of Cyprus. Cypriot cuisine is quite similar to Greek cuisine, though it has of course got influences from Turkish and other cuisines. The most famous Cypriot food product is the salty halloumi cheese made from sheep and goat milk. Lokum candy (aka Turkish delight) is also well-known. Seafood is plentiful, like on most island nations. Many different vegetables, fruit, legumes and nuts are also consumed, of vegetables especially zucchini, okra, taro, green beans, eggplant, artichokes, potatoes, beets, cauliflower, green peppers, tomatoes, cucumber, spinach, grape leaves, wild greens and avocados. Bulgur wheat is the staple starch. Cumin, coriander and mint are the most important spices and herbs, mint is especially used with meat. Parsley, thyme and oregano are also very popular, and olive oil and lemon also add flavour. Meat and sometimes vegetables are often served grilled in skewers. 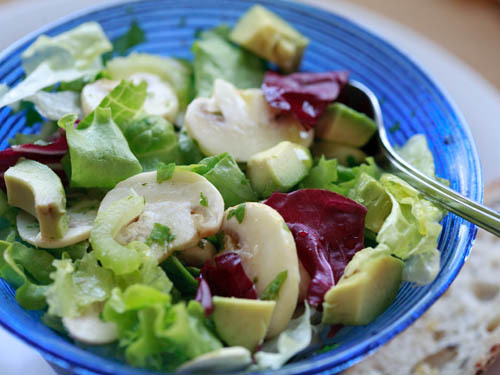 This salad recipe features raw mushrooms, but they are quickly “pickled” (ceviched?) in lemon juice, so they don’t taste so raw. The recipe was somewhat challenging, as the units are strange – “glasses” (probably closer to dl instead of cup), numbers without units (presumably grams), some types of ingredients weren’t clear and there seem to be both OCR mistakes and typos, as well. But since it’s a salad the ratios of all ingredients aren’t so important. However, the ratio of mushrooms and lemon was very clear in the recipe, but the resulting mushrooms tasted way too tart to me. So I would not use all of the lemon juice on the mushrooms (it wasn’t clear whether you are supposed to add it all at that stage. Or maybe I sliced them too thin? Also the amount of salad in the recipe seems excessive. I don’t really like celery so I used a bit less, but it wasn’t bad here, seems to go well with the lemon. Slice the mushrooms 20-25 minutes before serving. Place in a rather large bowl and sprinkle with lemon juice. Stir in the olive oil, salt, garlic and parsley. Add the celery, toss and leave aside. Wash, drain and tear the lettuce and place in a very large salad bowl. Just before serving, peel and stone the avocados. Cut them into quarters and then from the narrow side into thick slices. Add immediately to the mushrooms and toss gently. Put this mixture into the bowl with the lettuce, toss gently again and serve immediately. This entry was written on April 29th, 2015 by Maija Haavisto and filed under Europe, Salads.